disagreement | In the Key of "H"
Now I’m not super familiar with every name on the list, but I certainly would agree with his take on the teachers I know. These “preachers” preach a prosperity gospel equating the atonement of Jesus with guaranteeing riches and health in this life. The lack of health/wealth comes from lack of faith. Of course if my name had been called out in such a song, I might be moved to offer a response. Such was the case with the son of prosperity preacher Paula White. If interested, you can read that here. And then Shai Linne responded back here. I would recommend reading this because in it you will see a good example of how to respond to critics. Regardless of whether you agree with Shai on this matter, I think this dialog gives us all a solid blue-print for HOW to respond. I’ll highlight several things I found helpful. Shai had tweeted three days earlier that prayer and guidance would precede his reply. He wrote the response while traveling on Clear Sight Music’s Black Out Circuit Tour which has been on the road since April 5. The unedited letter is below. I’ve found with most people (including myself), we run to our own defense as if it were a race. The early bird does not catch the worm. Time is needed to respond, listen, digest, absorb, pray (James 1:19). I can’t tell you how many times I wish I would have applied this! But I’m thankful for the examples of others and hope we all can learn as much as possible from them. Three days is usually enough time to calm down, absorb, pray, and learn. Before I directly address the substance of your open letter, I first want to commend you for a few things that encouraged me as I read it….. I was encouraged to hear of your mother praying for your salvation, as well as teaching you the faith. Again, I can relate. I myself am the result of a praying mother. In fact, I once told my mom that I would never become a Christian. Even as I entered adulthood while continuing in rebellion against God, she never stopped praying for me. I am eternally grateful to her for crying out to God on my behalf when I was dead in my sins! So I was glad to hear you mention what you did about your mother. It’s a good model for other mothers to emulate. If Paul commended the Corinthians before getting into some of their issues, there is not only biblical precedence but also opportunity to do the same thing with our critics today. Shai does a good job of celebrating their common ground, which he no doubt found much easier than the issues going on at Corinth. I want to address a few of the false teachings themselves. I went straight to the Paula White Ministries website and your Youtube page so I could hear what you have released as representative of Paula White’s teaching. There are many things I could speak on, but I’ll highlight three here. It is easy to deal with implications of what others have actually and by-pass what he/she has actually said. That takes time. It is also easier to deal with what you have heard others say about a teacher/critic/enemy than dealing with what he/she has actually said. Perhaps what I appreciated most about Linne’s response was his diligence in documentation. Look how specific he gets! He’s shown love by taking the time to really understand and articulate his opponent’s viewpoint. He’s articulating a view point that his opponent can say, “Yes that is my position.” Or the opponent can say, “That is what I said, but you’ve misunderstood what I meant by what I said.” Either way, there is something concrete you can discuss without talking past each other. This would have taken a lot of time, but time is what it takes to properly deal with criticism or false teaching. And those who follow her must be warned. And just so you know, I have your email address and will gladly take this conversation offline with you if you’d like. Some internet dialog is a waste of time. 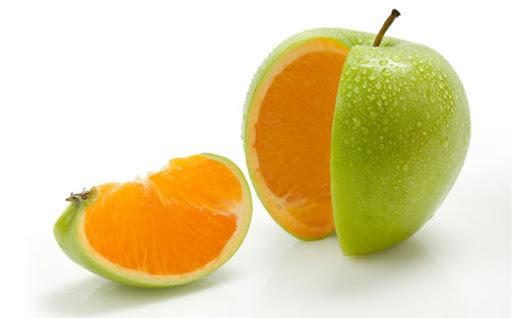 The opponent is probably not going to change his/her views and you will not be changing yours. But the invitation to further dialog is a way to show love and just may open the doors for real change down the road. Paula White’s son may be never be convinced of the heresy of the prosperity gospel. Yet he has had the opportunity to explore why Shai Linne believes she is a false teacher. And he has the opportunity to further explore should he choose. One of the highlights of the NFL, besides the Tampa Bay Buccaneers upsetting the New Orleans Sinners, or rather Saints, 26-20, was the questionable display of sportsmanship and concomitant retaliation for that questionable display. You can view the video here. 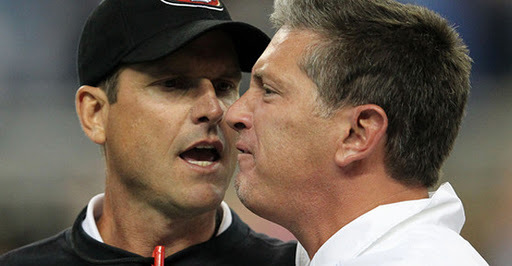 Yesterday, the San Francisco 49er’s coach Jim Harbough shook losing Detroit Lions coach Jim Schwartz’s hand. Then he “patted” or pushed, Schwart’z back. Problem. I guess you just have to stick with the hand shake because Schwartz took issue, and felt like he was pushing him out of the way. Then as Harbough tried to flee the scene and get to the locker room, Schwartz chased him down, bumped into him, and had to be separated. The NFL will will probably be handing out a few fines to both coaches sometime this week. But the interviews and commentary after the incident intrigued me. Jim Harbough claimed, “It was on me. I just came in to shake his hand TOO hard.” I appreciated his admission of guilt. However, I have a feeling that a football coach doesn’t take offense a hard handshake. Confession is great and can restore relationships. However, if that which we confess, isn’t exactly what offended the other party, it will go nowhere. Harbough appeared to be the humble one and take the high road, but in the end, his confession probably only increased the gulf betwixt these coaches. Now he may call Schwartz and they may later have a cup of tea, or pint of beer, or whatever they drink. But I’m simply responding to the interview. What you apologize for is as important as how you apologize. Schwartz claimed Harbough’s “sportsmanship,” comprised profanity among other things, including the “push” as more than a pat. He on the other hand, was unapologetic. He ignored the “chase down.” While what offended him was left unaddressed by Harbough, he completely ignored his part: chasing down a coach and having to be physically separated. Often times folks do us wrong. It’s often more than a subtle (in my opinion) “push-pat” confusion. But our response to sin doesn’t have to be some form of blatant or subtle (cold shoulder, gossip, bitterness) retalliation. We can instead explain that such and such a move was either “busch-league” or whether it really was clearly sin. This is hard. I’d rather snub someone, than tell them they hurt me. Sometimes retaliation is blatant. Sometimes it’s the subtle response we need to repent from. And I hate it for myself, and you-as we often want to vicariously get people back through other people. But I don’t get a vote, and you don’t either. The commentary was solid. Coach Dungy recognized that even though someone wrongs you, you can’t retaliate. Of course this only makes sense with a Christian worldview, where Christ ended the need for the “I got you last game,” with his once for all death for sins. As a result, we don’t NEED to get people back because Jesus took care of our sins. He is the peace offering, who has made the two groups who believe-Gentile and Jew, 49’ers and Lions, offender and offended-one in Christ (Eph 2:14). Finally, Rodney Harrison, who regularly was voted the league’s dirtiest player, and handed down multiple fines for his illegal hits had this to say: “What will you tell you kids?” I found that a bit close to ironic. But maybe there is an on-field ethic distinct from an off-field (when game has ended) ethic. Having not played the game, I can’t make a call. Still, Harrison brings a great challenge to all those in leadership. Your teachings have to apply to you. For instance, you can’t tell your kids, “Its important to go to church,” and then go to church when its convenient for you. Believe me, somehow it will not be convenient for them when in college, or any time after that. I purchased a mini-subscription to the magazine Rolling Stone a few months ago for 5 dollars. I then received about 6 or 8 different issues. Some of the stuff in Rolling Stone magazine is a bit over-the-top vulgar (as I found out), but I figured the articles might help me better understand a culture who reads Rolling Stone. As it so happens, no such culture exists where I live. So it obviously didn’t help, and I was quite turned off by much of the content anyway. I didn’t renew the mini subscription. However, the final issue I received had a fairly telling article with “The Daily Show’s” Jon Stewart. I figured this was worth a read for a number of reasons. Many college students and young adults (and at times older adults) get their news from “The Daily Show.” Jon Stewart is viewed as an honest and reliable authority, so I finally figured I’d get my 5 dollars worth. I think I would have, had I been able to finish the article. My three year old Connar, decided to pee all over the bathroom one day and thoroughly saturated the magazine. So needless to say, I didn’t get to finish. But I did get half way through the article, feeling as though I at least got my $ 2.50 worth. Stewart actually posited some information that would be helpful for the church to hear. I would like to use exact quotes, but since I don’t have online access to the article, and the urine soaked magazine was thrown away before I had a chance to read a potentially “sun-dried” version with gloves on (my wife tossed it), I’ll have to speak with italics instead of quotes. I try to stay away from demonizing my opponents. I mean, I realize that not everyone who is against gay marriage is homophobic. What a breath of fresh air! Just because someone may vote against gay marriage, does not mean that they hate gay people. Obviously. But its great to hear someone who has such a voice use it, at least this time, so correctly. Christians have a hard time following Stewart’s example. We tend to demonize the other side, whether it be with other Christians whom we disagree, or those of opposing political parties, religions, etc…. Tim Keller offers some helpful and godly ways to disagree and debate, that if followed, may allow you to actually be heard by your opponent. That should be our goal, not just hearing ourselves speak. In other words, we need to be careful to love our opponents, whether they be a brother/sister in Christ, a colleague outside of Christ, or a flat out enemy. This is probably my final 9/11 thought for a while. Most likely. The writer laments how the attacks of 9-11 distanced the Christian-Muslim-Jewish communities from each other. And obviously he is right. Folks are probably more wary of Islam than when I was in college in 1999. They may see more of a distinction with this religion. If branches of Islam lead people to fly planes into buildings and also kill other branches of Islam, then obviously that doesn’t seem like the same faith. And the truth of the matter is that he does have a point. Not all branches of Islam, particularly in America advocate violence. Nevertheless some do, and go on killing rampages like the disaster at Ft. Hood. And of course, “Christians” in the name of “Christianity” kill people in Jesus’ name. Our mini “melting pot” succeeded because we focused on the commonalities between Islam and Christianity, the most obvious being that we worship the same God. How could we not? After all, we share almost identical prophets such as Moses, Abraham and Jesus. 15 He is the image of the invisible God, the firstborn of all creation. 16 For by him all things were created, in heaven and on earth, visible and invisible, whether thrones or dominions or rulers or authorities- all things were created through him and for him. 17 And he is before all things, and in him all things hold together. 18 And he is the head of the body, the church. He is the beginning, the firstborn from the dead, that in everything he might be preeminent. If I’m praying to Jesus, who is more than a prophet, but the 2nd person of the Trinity, then its pretty hard to argue that someone who says, “Nope, Jesus was just a prophet, and a heck of a nice lad,” is praying to the same God. If Jesus called Jews who didn’t believe in Him “children of the devil” (John 8:44) and that our shared history of Moses and Abraham did not mean Jews and Christians were “on the same page”-Abraham rejoiced at seeing Jesus (John 8:56) then I don’t think it would be a great leap to think Jesus would have said the same things about a future religion which shared common roots but minimized or disbelieved in His deity. We can just agree to disagree and still be friends, and extended family members with cordial relations, can’t we? Do we have to agree in order to be friends? While that’s a present American fallacy, I’m pretty sure that it wasn’t this way when we started. Regardless, Jesus prayed for those who ignorantly disbelieved in Him, and so can we (Luke 23:24). The problem is that there is no American paradigm for disagreeing with someone’s religion or sexual preference but at the same time still befriending and getting to know them. What that means is that Christians have an opportunity to prayerfully, lovingly, and patiently introduce and demonstrate that to our culture. Matt Chandler, Tim Keller, Micheal Horton have set down for a series of conversations on different topics. In this clip, Keller leads the discussion on “how to disagree” with others. Its about a 13 minute clip and worth it to hear folks with differing philosophies of ministry, but still within the wider Reformed camp, agree on how we can disagree with one another. Chandler hit a home run with his concern of people attacking 5 minute you tube clips of a 50 minute sermon, completely ignoring the entire body of work. I actually heard someone bash Keller, even calling his presentation of the gospel “a joke,” because of a you tube clip someone sent him. Unfortunately the hermeneutic he uses to study the bible (context, big picture) wasn’t applied to that short clip. One take-away from this video, for all folks who find themselves theologically/philosophically differing with their brothers and sisters in Christ: make sure what YOU think your opponent is saying IS IN FACT what they are saying. That is one way to love those with whom you differ.